FERDINAND RIES (1784-1838): Violin Sonata in C Sharp Minor, Op. 71, RODOLPHE KREUTZER (1766-1831): Violin Sonata, LUDWIG VAN BEETHOVEN (1770-1827): Violin Sonata No. 9 in A Minor, Op. 47 "Kreutzer". Description: There are five pages of notes to this disc and all of them are on the Beethoven - not a word about the two sonatas we want to know about. 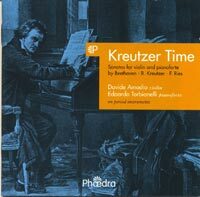 So all we can tell you about the Kreutzer is that it probably dates from the 1790s and is extrovert, brilliant and virtuosic with both instruments getting plenty of opportunity while the Ries (and you can't date him by opus number due to gaps between composition and publication) is a serious piece of late Classical chamber music befitting a student of Beethoven. No other recordings available of either. Davide Amodio (violin), Edoardo Torbianelli (fortepiano).